Irene and Everek Storms, 1982. Everek Richard Storms was a school principal, denominational magazine editor and church historian of the Missionary Church. Born in the Armenian city of Everek, Turkey, on 19 October 1914 to Dorwin Jonathan Storms (7 June 1883-19 November 1948) and Anna (Nancy) Good Storms (9 April 1880-22 December 1965), Everek did not live long in Turkey. His family, serving with the mainly Mennonite Brethren in Christ Church (MBiC) “United Orphanage and Mission,” fled when he was 19 days old after the Ottoman Empire declared war on Britain. Dorwin Storms, of Loyalist ancestry grew up in Louth Township, Lincoln County, Ontario, Canada, in the MBiC Twenty circuit, while Nancy was from Conestogo, Waterloo County, Ontario. In Ontario, Everek's father had been a preacher for the MBiC Ontario Conference 1910-1913 and he returned to it for 1915-1920, including two years at Hespeler where Everek's one brother was born, but he also served Congregationalist churches (at Shelburne and Wainfleet) and briefly the Christian and Missionary Alliance. By 1925 the family was in Port Elgin, Ontario. In Owen Sound on 18 August 1945, Everek Storms married Irene Welch (13 August 1913-31 December 1989) whom he met in the MBiC Owen Sound Youth Fellowship. She was from England, a daughter of Francis and Maria Welch. Irene and Everek had a son and a daughter while members of Bethany United Missionary (now Evangelical Missionary) Church, Kitchener. In 1960 they were founding members of Faith Missionary Church, Kitchener. Everek died of a heart attack at home on 30 November 1983; Irene of cancer at her daughter's home in Burlington, Ontario. They are buried at the Union Cemetery of St. Matthew's Lutheran Church at Conestogo, Woolwich Township, in the Region of Waterloo. Everek Storms counted Port Elgin as his Canadian home town, where he was converted through the Mennonite Brethren in Christ at age 11, baptized (in Lake Huron) at 15 and joined the congregation at 17. He graduated from McMaster University with a BA, and with an MA (1948) from Winona Lake School of Theology, Indiana with a thesis on the history of the United Missionary Society in Nigeria to 1948. In 1974, Bethel College, Mishawaka, Indiana, awarded him an honorary Doctor of Laws. Although Everek Storms was a school teacher and principal for about 40 years, mostly in Kitchener, he briefly worked as a correspondent for the Owen Sound Sun-Times, and journalism was to be his second vocation. His educational career concluded with 15 years as a principal of Margaret Street Public School, from which he retired in 1973. He also taught part-time at Emmanuel Bible College, Kitchener. In the 1952 General Conference, the United Missionary Church (UMC) elected Everek Storms as the editor of its denominational magazine, the Gospel Banner, until the merger of the UMC with the Missionary Church Association in 1969. The new body, the Missionary Church, called on him again to edit the church magazine, Emphasis: On Faith and Living from 1974 to 1982. He had been an associate editor from 1969 to 1974. His editorials were personal in tone; he was a promoter of every good thing in the denomination, and he kept his disappointments to himself, though he warned of unhealthy trends. As early as 1937, Everek Storms began collecting documents and interviews related to MBiC/ UMC/ Missionary Church history. His large collection about the binational Missionary Church is a treasure preserved at the Missionary Church Archives at Bethel College, Mishawaka, Indiana. His love of the church issued in a number of historical projects from brief congregational histories (Port Elgin,1942/ 1972, Owen Sound, 1948) and missionary and leadership profiles, to full histories of the denomination's foreign missionary efforts (What God Hath Wrought, 1948) and the church (History of the United Missionary Church, 1958). In addition, he published yearbooks of the MBiC/ UMC (1946 to 1952), and a number of booklets of poetry and Christmas program materials. He also contributed several articles to the original Mennonite Encyclopedia (1955-59). Widely known by sight in all the districts of the Missionary Church in the USA and Canada, in Kitchener, Everek Storms was known not only for his “good sense of humor, strong Christian commitment, bow tie, white hair and ever-present commitment to the Missionary Church,” but also for walking around the city while reading. He claimed he “hardly ever” bumped into anybody. 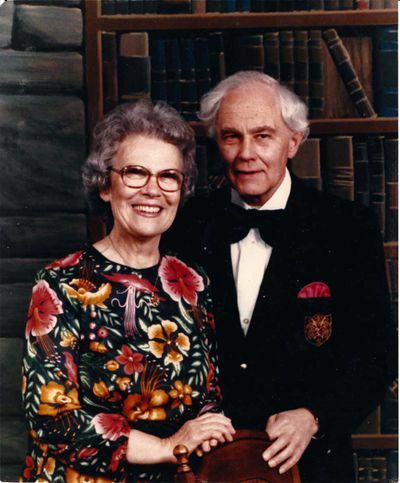 Everek and Irene were members of the Gideons for nearly 40 years. He loved to read the Bible and by 1982 had completed reading it 67 times. Canada census (1891, 1901, 1921). “Former Principal Everek Storms Dies.” Kitchener-Waterloo Record (30 November 1983): B4. "Rev. Dorwin J. Storms" Waterloo Region Generations. Web. 9 May 2016. http://generations.regionofwaterloo.ca/getperson.php?personID=I26632&tree=generations. Pannabecker, Ray P. “By Way of Introduction.” Gospel Banner (3 January 1952): 3. “Remembering Irene Storms.” Funeral bulletin (3 January 1990). [Reynolds, Michael]. “Everek Storms...With the Lord.” Emphasis (January 1984): 9. [Reynolds, Michael]. “Irene Storms Passes.” Emphasis (March 1990): 5. Storms, Everek R. “Banner Editor a Layman, Not Ordained.” Gospel Banner (28 December 1961): 5. Storms, Everek R. “The Editor Tells His Story.” Emphasis (December 1982): 21-23. “Storms-Welch,” Gospel Banner (27 September 1945): 15. “Writing Not Just Hobby for Minister and Principal.” Kitchener-Waterloo Record (2 November 1963). Fuller, Clare. "Storms, Everek Richard (1914-1983)." Global Anabaptist Mennonite Encyclopedia Online. August 2016. Web. 22 Apr 2019. http://gameo.org/index.php?title=Storms,_Everek_Richard_(1914-1983)&oldid=135791. Fuller, Clare. (August 2016). Storms, Everek Richard (1914-1983). Global Anabaptist Mennonite Encyclopedia Online. Retrieved 22 April 2019, from http://gameo.org/index.php?title=Storms,_Everek_Richard_(1914-1983)&oldid=135791. This page was last modified on 29 August 2016, at 19:46.